There’s no point in growing wholesome fresh produce and then spoiling it. If you grow your own vegetables then you are going to be interested in the quality of your food and, having grown the perfect cabbage, you don’t really want to boil it for 2 hours! These recipes are my own favourites and those contributed by friends and forum members over the years. Hopefully they’ll help you out and prove useful when you’ve a glut coming in from the plot. For example, we’ve over 40 courgette recipes so when you’ve more than you know what to do with, just look courgettes up and get some inspiration. Don’t forget we’ve covered some great ways to store summer crops for a cold winter’s day. If you look at the cooking & storing guides we cover freezing food including blanching – there’s even a chart you can download and print out at home. We’ve a lot of recipes sent in by our visitors – if you have a recipe you think we would like, why not send it in to us here? To try and help you find a recipe that you want we’ve set up multiple categories. You will find the same recipe can appear in upto five sections. For example, Val’s Hot Aubergine Chutney is suitable for vegetarians, a vegetable recipe, based on aubergines and so it appears in those sections. Hope it makes it easier for you. 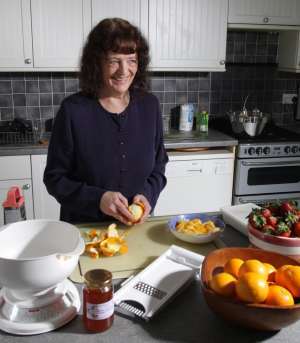 Don’t forget when looking up recipes from the section list on the right that you can expand – so to just get marmalade recipes, go to Val’s Preserves and click [expand] to show marmalades and the other sub-sections. If you’re a vegetarian, you can quickly check if a recipe is suitable for vegetarians by looking at the ‘Filed Under‘ bit under the recipe. I used to help run a vegetarian wholefood cafe when I was at university. Tasty, filling and most importantly to students, cheap! Underneath each recipe there is a comment box – if you’ve tried a recipe why not tell us how it worked out or if you’ve made a variation on the recipe let us know. If it didn’t work out for you, that’s valuable to know as well. Maybe I can help tell you where things went wrong. Your email is required to make a comment but will not be published or given to anybody but us. It is only so that we can reply directly to you if required to clarify a point etc. Comments will not appear immediately, we check things first before they appear to ensure they are appropriate and not spam etc.